Musch MW, Mamah D, Gawenis LR, Zhang Z, Ellsworth W, Shalowitz D, Efthimiou P,…, Barrett TA. “T-cell activation causes diarrhea by increasing intestinal permeability and downregulating epithelial Na+/K+ATPase” Journal of Clinical Investigation, 2002, 110:1739-1747. Efthimiou P, Markenson JA. “Role of Biologic Agents in the Treatment of Immune Mediated Inflammatory Diseases”. Southern Medical Journal, 2005, 98(2): 192-204. Efthimiou P, Paik P, Bielory L. “Diagnosis and Management of Adult Onset Still’s Disease (AOSD)”. Annals of Rheumatic Diseases, 2006; 65: 564-572. Ramaswami R, Efthimiou P, Gnanasekaran I. “Musculoskeletal Manifestations of Dialysis; an update” Clinical Rheumatology, 2006 Jul;25(4):440-2. Efthimiou P, Schwartzman S, Kagen L “Possible Role for TNF-Inhibitors in the Treatment of Resistant Dermatomyositis and Polymyositis”. Annals of Rheumatic Diseases, 2006, Sep;65(9):1233-6. Rosenkranz ME, Agle LM, Efthimiou P, Lehman TJ. “Systemic and localized scleroderma in children: current and future treatment options”. Paediatric Drugs. 2006;8(2):85-97. Ogden NS, Ward CM, Kontzias A, Wyatt ST, and Efthimiou P. “Adult Onset Still Disease: 20 Clinical Pearls” Journal of Musculoskeletal Medicine, 2006; 23:788-800. Efthimiou P. “Tumor Necrosis Factor alpha in inflammatory myopathies: pathophysiology and therapeutic implications”. Seminars in Arthritis and Rheumatism, 2006 Dec; 36(3): 168-72. Efthimiou P and Georgy S.¨Pathophysiology and Management of Adult Onset Still’s Disease”. Seminars in Arthritis and Rheumatism, 2006 Dec; 36(3): 144-52. Blake AD, West FM, Ghafoor S, and Efthimiou P. “Somatostatin Involvement in Rheumatoid Arthritis” Current Rheumatology Reviews, 2007; 3:31-36. Efthimiou P,Ward MC, Kontzias A, Ogden NS. “Adult Onset Still’s disease: Can New Pathophysiologic Clues Guide Future Targeted Treatments?” Nature Reviews Rheumatology, 2007 Jun; 3(6): 328-335. Efthimiou P, Kumar S. “Development of Olecranon Bursitis after Treatment with Abatacept in a Patient with Rheumatoid Arthritis” Contemporary Topics in Rheumatoid Arthritis, 2007; 1(3): 6-8. Efthimiou P “Translating Basic Research Findings into Therapeutic Advances in Rare Rheumatologic Disorders: Lessons Learned from Adult Onset Still’s Disease” Contemporary Topics in Rheumatoid Arthritis, 2007; 1(4): 4-9. Efthimiou P, Nasis O, Lehman TJ. “Aortic aneurysm in Takayasu’s arteritis” Journal of Rheumatology, 2007, Nov;34(11):2312. Yavari N, Platt H, Michel R, Navarro C, and Efthimiou P.” Environmental and Occupational Exposure in Rheumatoid Arthritis” Journal of Musculoskeletal Medicine, 2008; 25:130-136. Efthimiou P et al. “Autoinflammatory syndromes and infections: pathogenetic and clinical implications”. Clinical Experimental Rheumatology, 2008; Jan-Feb;26(1 Suppl 48):S53-61. Efthimiou P, Nasis O, Russell LA. “Classic presentation of a rare disease: melorheostosis”. Journal of Rheumatology, 2008 Jun;35(6):1169. Souayah N, Chodos A, Krivitskaya N, Efthimiou P, Lambert WC, Sharer LR. “Isolated severe vasculitic neuropathy revealing sarcoidosis”. Lancet Neurology. 2008 Aug;7(8):756-60. Efthimiou P.” Preoperative management of patients with rheumatoid arthritis underdoing elective surgery while being treated with abatacept”. Contemporary Topics in Rheumatoid Arthritis, 2008; 2(4):6-9. Petryna O, Yavari N, Efthimiou P. “Occupational and Environmental Exposures in Lupus and Systemic Sclerosis: A preventable Risk Factor?” Journal of Musculoskeletal Medicine, 2010; 27:395-402. Efthimiou P, Kukar M, Krishnan P. “Posterior Reversible Encephalopathy Syndrome (PRES): a severe manifestation of neuropsychiatric systemic lupus erythematosus (NPSLE)” Arthritis and Rheumatism, 2010 Jun;62(6):1692. Efthimiou P, Kukar, Hersh A. “Rituximab and Lupus Interstitial Lung Disease: Friend or Foe?” International Journal of Rheumatic Diseases, 2011 Feb; 14(1): e3-4. Efthimiou P, Pokharna H, Kukar M, Hennessey K. “PCP Chemoprophylaxis is Essential for Lymphopenic Dermatomyositis Patients Treated with Immunomodulators”, Muscle & Nerve, 2011 Jun; 43 (6):918-9. Efthimiou P, Kukar M. “Lupus Pernio: Sarcoid-specific Cutaneous Manifestation Associated with Chronic Sarcoid Arthropathy”, Journal of Clinical Rheumatology, 2011; 17 (6): 343. Kontzias A and Efthimiou P. “”The Use of Canakinumab, a Novel IL-1β Long Acting Inhibitor, in Refractory Adult-onset Still’s Disease.” Seminars in Arthritis and Rheumatism, 2012 Oct; 42(2):201-5. Kadavath S and Efthimiou P. “Canakinumab in Autoimmune and Autoinflammatory Rheumatic Diseases.” Expert Opinion on Orphan Drugs, Jan 2014, Vol. 2,1, pp 27-35. Efthimiou P, Kadavath S, Mehta B.”Life-threatening complications of adult-onset Still’s disease. Clinical Rheumatology. 2014 Mar;33(3):305-14. Kadavath S, Zapantis E, and Efthimiou P. “A Novel Therapeutic Approach In Adult Onset Still`s Disease- Associated Pulmonary Hypertension: Targeting Interleukin 6” International Journal of Rheumatic Diseases, 2014, International Journal of Rheumatic Diseases. 2014 Mar;17(3):336-40. Kadavath S and Efthimiou P.”Adult-onset Still’s disease-pathogenesis, clinical manifestations, and new treatment options” Annals of Medicine. 2015 Jan 22:1-9. Kadavath S, Bobic S, Efthimiou P. “Use of B lymphocyte stimulator inhibitor belimumab may be associated with a decrease in the serum concentration of epidermal growth factor in patients with primary Sjögren’s syndrome.” Clinical Rheumatology. 2015;34(9):1651-1652. Afzal A, Chittalai S,Wong I, Efthimiou P. “Unmasking IgG4-related autoimmune pancreatitis from pancreatic cancer: A lesson learned” Int J Case Rep Images. 2016;7(2):123–126. Mehta B, Zapantis E, Petryna O, Efthimiou P “Screening Optimization of Latent Tuberculosis Infection in Rheumatoid Arthritis Patients”. Arthritis, 2015;2015:569620. Efthimiou P, Yadlapati S. “Impact of IL-1 inhibition on fatigue associated with Autoinflammatory syndromes” Modern Rheumatology. 2016; Jan;26(1):3-8. Yadlapati S, Efthimiou P. “Inadequate response or intolerability to oral methotrexate: Is it optimal to switch to subcutaneous methotrexate prior to considering therapy with biologics?” Rheumatology International. 2016 May;36(5):627-33. Yadlapati S, Efthimiou P. “Autoimmune/Inflammatory Arthritis Associated Lymphomas: Who Is at Risk?”. BioMed Research International, 2016; 2016: 8631061. Bello AE, Perkins EL, Jay R, Efthimiou P. “Recommendations for optimizing methotrexate treatment for patients with rheumatoid arthritis” Open Access Rheumatol. 2017 Mar 31;9:67-79. doi: 10.2147/OARRR.S131668. eCollection 2017. Bottai M, Tjärnlund A, Santoni G et al. International Myositis Classification Criteria Project consortium, the Euromyositis register and the Juvenile Dermatomyositis Cohort Biomarker Study and Repository (JDRG) (UK and Ireland) “EULAR/ACR classification criteria for adult and juvenile idiopathic inflammatory myopathies and their major subgroups: a methodology report” RMD Open. 2017 Nov 14;3(2):e000507. doi: 10.1136/rmdopen-2017-000507. eCollection 2017. Schwartzman S and Efthimiou P. “Progressive Systemic Sclerosis (PSS) and Related Disorders”. Chapter in: American College of Physicians (ACP) Expert Guide to Rheumatology, 2005, pp135-147, ACP Publications, Philadelphia, PA.
Efthimiou P, Petryna O, Kukar M. “Complex situations in patients with adult-onset Still disease” in Autoimmune Diseases: Complex and Acute Situations, 2011, pp 221-232, Springer, NY, NY. Efthimiou P, Kontzias A. “Treatment of Rheumatoid Arthritis” chapter in: Encyclopedia of Medical Immunology, Eds: Ian R.Mackay, Noel R. Rose, Springer, NY, NY, 2014. Yadlapati S, Efthimiou P. “Cyclic Neutropenia”, chapter in: 5-minute clinical consult, 26th, 27th, 28th Eds, Ed: Frank J. Domino, Wolters Kluwer, NY, 2018-20. Yadlapati S, Efthimiou P. “Adult Onset Still’s Disease”, chapter in: Auto-Inflammatory Syndromes: Pathophysiology, Diagnosis, and Management, Springer-Nature, NY, 2019. Mehta B, Efthimiou P. “Macrophage Activation Syndrome”, chapter in: Auto-Inflammatory Syndromes: Pathophysiology, Diagnosis, and Management, Springer-Nature, NY, 2019. Ruiz-Fernandez R, Efthimiou P. “Clinical Genetics in Rheumatology”, chapter in: Absolute Rheumatology Review, Springer-Nature, NY, 2019. 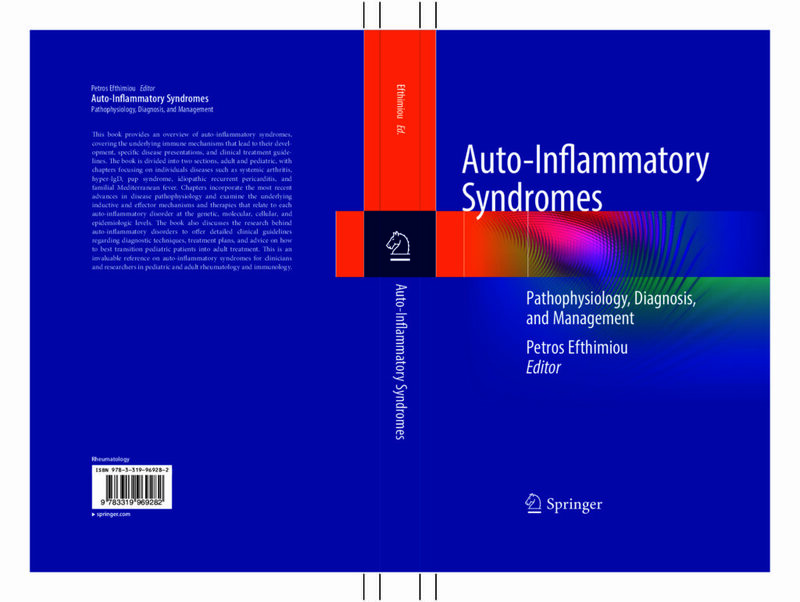 Efthimiou P, Editor-in-Chief, Textbook, Auto-Inflammatory Syndromes: Pathophysiology, Diagnosis, and Management, Springer-Nature, NY, 2019. Efthimiou P and Barrett TA. Rosenkranz ME, Agle L, Efthimiou P, Onel KB, Lehman T JA. Ramaswamy D, Gnanasekaran I, Nikolov N, Efthimiou P, Gour N, Paget SA. Efthimiou P, Schwartzman S, Kagen L. “Is There a Role For Anti-TNF Therapy in Dermatomyositis and Polymyositis?” Podium presentation, 2004 EULAR, Berlin, Germany. Annals of the Rheumatic Diseases, 63: 67-67 Suppl. 1 Jul 2004. Efthimiou P, Rosenkranz ME, Lehman TJ. “Does Etanercept Have A Role In The Treatment Of Juvenile Dermatomyositis?” Annals of the Rheumatic Diseases, 2005; 64(Suppl III):573. Annals of the Rheumatic Diseases, 2005; 64(Suppl III):575. Mehta B, Efthimiou P “PREVALENCE OF ARTHRITIS INCREASES WITH OBESITY AND LOW SOCIOECONOMIC STATUS:EXTRAPOLATED DATA FROM A 10-YEAR UNITED STATES NATIONAL SURVEY” Poster presentation, EULAR 2015 Scientific Meeting; June 9-13, 2015, Rome, Italy. Feist E, Quartier P, Fautrel B, Schneider R, Sfriso P, Efthimiou P, Cantarini L, Lheritier K, Leon K, Karyekar C, Speziale A. “EFFICACY AND SAFETY OF CANAKINUMAB IN PATIENTS WITH STILL’S DISEASE: A POOLED ANALYSIS OF SJIA DATA BY AGE GROUPS”, Poster presentation, EULAR 2017 Scientific Meeting; June 14-17, 2017, Madrid, Spain. Mehta B, Briggs M, Efthimiou P. “EPIDEMIOLOGY AND COMPLICATIONS OF HOSPITALIZED PATIENTS WITH ADULT ONSET STILL’S DISEASE IN UNITED STATES: A NATIONWIDE ESTIMATE”. Poster presentation, EULAR 2017 Scientific Meeting; June 14-17, 2017, Madrid, Spain.